Health care reform should come with a Help Wanted sign: Nurses are needed to help care for 32 million people. That’s how many Americans are expected to gain health coverage starting next year. Many will be eager to tap into the kind of preventive medical care that holds the promise of more healthful lives. On the front lines of providing that type of care will be nurses, and the country won’t have enough of them, many experts believe. It won’t have enough doctors and other advanced practitioners, either. For years, nursing schools have been airing worries that they can’t graduate nurses fast enough to keep up with demand – especially programs that offer bachelor’s and master’s degrees, as employers demand more education and expertise. The recession delivered a mild reprieve. The exodus of nurses from the workforce slowed as retirement savings were decimated, family members lost employment and health insurance costs soared. Lin Murphy, chairwoman of the nursing department at Gonzaga University, believes the shortages are poised to return now that health reforms are falling into place, the stock market has rallied and large numbers of nurses older than 55 are nearing retirement. “The need is there now. It will be critical by 2020. It will be a great time to be a nurse,” Murphy said. Gonzaga is preparing plans to build and open a fully accredited school of nursing. There are about 3.1 million nurses in the United States, and more than 10 percent – about 300,000 – could be ready to retire during the next several years, said a report by the Washington State Nursing Association. Health care reform will present major challenges and opportunities for the nursing profession, said Patricia Butterfield, dean of Washington State University’s School of Nursing in downtown Spokane. Nurses and advanced nurse practitioners will be asked to have a much greater say in patient care and help to hold down the cost of care – one of the major drivers of reform. The American Nursing Association claims that nurse-managed care coordination already trims Medicare spending by up to $5,000 per patient per year. Among the deepest challenges to fulfilling this looming demand is the need for more teachers engaged in nursing education. 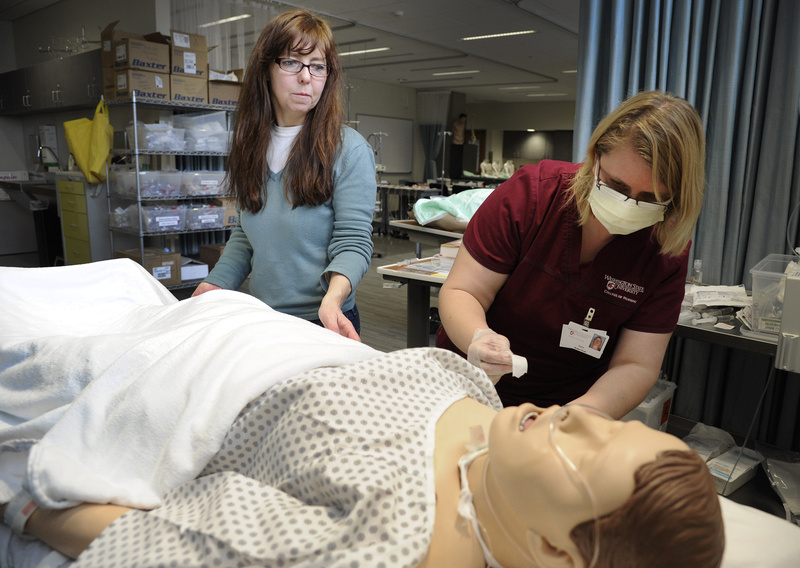 Admission to the WSU nursing school remains intensely competitive, said spokeswoman Alison Benjamin, partly driven by the need for more educators. The Patient Protection and Affordable Care Act calls for strengthening nursing programs with federal funding. The health care reform law also aims to cure the problem of faculty shortages, which is blamed for turning away 50,000 qualified nursing applicants every year, according to the American Journal of Nursing. It will do that in part by lifting federal spending caps on traineeship programs for graduate students. Butterfield noted that many nurses now graduating are finding that jobs are not as plentiful in hospital settings. Those tend to be higher-wage, union jobs dominated by nurses with years of experience. However there are plenty of jobs in other health care areas such as in clinics and homes for the elderly, she said. Pay for nurses throughout the profession ranges from $53,000 to about $85,000. Hospitals have been trying to carefully manage their schedules and workforces to control costs. One way to do that is to employ more advanced nurse practitioners who have the skills to manage clinics, supervise staff and make the appropriate referrals to physicians. The federal Centers for Disease Control reported that 17 percent of patients were cared for by an ARNP or a physician assistant in 2009 – that’s up from about 11 percent in 1999. Those numbers are growing, said Butterfield. “These nurses and practitioners are the problem-solvers in very dynamic and unpredictable situations,” she said. “And it’s not all at a hospital.